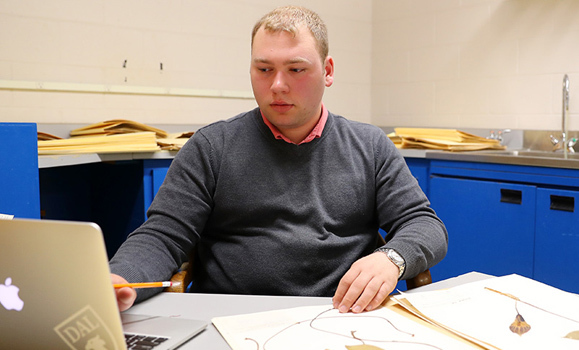 Even though Nick Belliveau received his degree in May, he’s still spending most of his days in the Biology department. 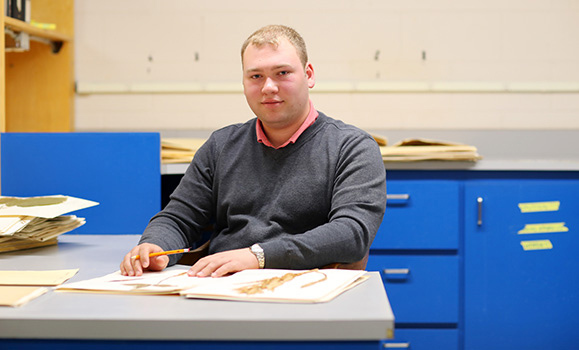 That’s because Nick is helping to digitize the university’s nearly 100-year-old Herbarium. A herbarium is a collection of preserved plant specimens usually dry mounted on archival paper and stored in file cabinets. To take these physical records and turn them into digital files is a big job — one that’s perfectly suited to a Biology graduate who has developed a keen interest in plants. Once he decided to commit to studying plants, he took any courses he could that were relevant to the subject including the Tropical Ecology & Biodiversity Field Class, which took Nick and 16 classmates to Sri Lanka for 18 days. For his honours thesis Nick had an opportunity to do some field work closer to home. He spent a month in the field looking at the difference between what the Forest Ecosystem Classification calls Treed swamps and Tall Shrub swamps in Nova Scotia. In addition to getting some rewarding time in the field and meeting other like-minded people, Nick’s local ecological survey was invaluable preparation for the herbarium project. The Herbarium Digitization Project is a collaboration between the Department of Biology and the University Archives. A four-step process, the digitization involves verification, cataloguing, recording included information and then photographing each specimen. While taking the Herbarium through this process, Nick has uncovered a few fun surprises. Nick also came across a specimen that has a journal article from the 1930s attached to it. Nick received the Sarah Lawson summer research scholarship so he can work on the project full time over the summer. At the end of August, he moves to Saskatoon to start a master’s degree in Plant Systematics.